An apparatus for measuring the force exerted in chewing food. A study is being made with a phagodynamometer to determine the physical force used while chewing food. A specialist in eating and the study of eating or ingesting foods. 1. The study of eating, consuming, or feeding. 1. An insatiable hunger or craving for food, or an obsessive preoccupation with the subject of eating: George has a passion or a phagomania for eating large quantities of various kinds of food. 2. 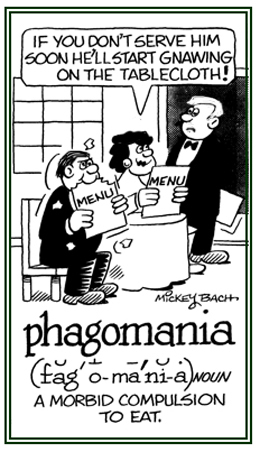 Etymology: from Greek phago, "to eat" + -mania, "compulsion, obsession; madness." © ALL rights are reserved. An abnormal or irrational fear of eating or swallowing certain kinds of food. Consisting of autotrophic algae or algae that is capable of securing its own food as opposed to being parasitic. The treatment of an illness with specific kinds of food. An organism that obtains nutrients through the ingestion of solid organic matter. This class of organism includes all animals from the simplest, single-celled animal (for example, the protozoa) to the higher life forms. Organisms have some type of device to ingest particles, a digestive system, and a system to discard waste products; the opposite of osmotroph. 1. Eating particles of food; feeding by ingestion; engulfing food (no fungus does this). 2. Organisms that feed by ingesting particulate organic carbon or intact cells. 1. Feeding by ingesting organic particulate matter. 2. A reference to cells in the blood or body fluid that ingest foreign particles. An animal, or animals, feeding on disintegrating or dead tissue. A rare term that refers to the suppression and/or liquidation of those whose personalities and convictions are incompatible with or nonconforming to existing authoritarian standards. The consumption of seaweed or algae; especially, in a food chain. Related "eat, eating" word units: brycho-; esculent-; esophago-; glutto-; vor-. If you would like to take self-scoring quizzes over some of the words in this thematic unit, then click Phago Quizzes, so you can evaluate your knowledge about some of these "eat, eating" words. Showing page 14 out of 19 pages of 274 main-word entries or main-word-entry groups.